I have always said "Shooters are the nicest people." Always polite and willing to lend a hand, spare ammo or equipment. This past weekend they also put their money to work for a terrific cause, raising awareness and treatment options for Veterans at risk and donating their match fees to help. The Mission 22 organization was organized in response to the quiet but pervasive national crisis which sees 22 Veterans a day taking their own lives. 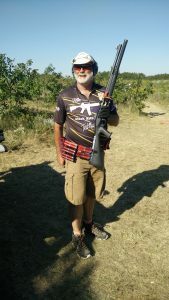 Match organizers Matt "Tank" Metzger and James Welker worked with the Aurora Sportsmans Club (ASC) to put on the club's first ever major 3 gun match with the proceeds going to the Mission 22 charity. Sponsors came up with tons of donated prizes for the shooters, and the ASC allowed the match to be run on their new extended facility located behind the main club and effectively doubling the size of the club's shooting bays. Matt Metzger was especially appreciative the ASC club let the match be held on their new ranges, and hosting hundreds of shooters over two days on ten extended round count stages which are far outside "normal" shooting range standards with brightly clad shooters in "Go-Fast" Shirts and wild conglomerations of guns running and shooting over large bays instead of merely standing still shooting at a set target on normal public and private ranges. The only limitation to this 3 gun match was the farthest rifle shot was a plate rack at 100 yards. Metzger said there are plans for next year to be able to shoot out to 600 yards. One "Jungle Run/Pasture Run" had contestants shooting a shotgun only stage with 38 steel and claybird targets and two spinners that must be knocked over and finished with two steel shotgun slug targets at 85 yrds-that was a busy 180 seconds. I think I had 54 rounds of shotgun shells on my belt for that one…good thing I have so much waistline to accomodate this stage. Many shooters use high capacity chest rigs full of shotgun shells, a smart choice, I have never used chest rigs to avoid looking like North Korean infantry. The shooters drug their rifles, pistols and shotguns and a ton of ammunition to the ASC from all over Illinois, Iowa, Minnesota, Wisconsin and Indiana. 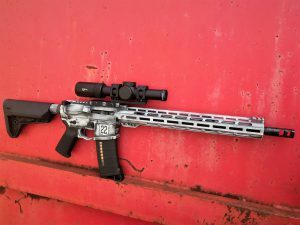 Each shooter expended about 200 rounds of shotgun, 200 rounds of pistol and nearly 200 rounds of rifle during the event…all timed by electronic timers while running, shooting and reloading with generally amazing dexterity. My efforts at Quad-loading four shotgun shells at once frequently de-evolved into my nearly patented "Try-load" method of trying to load four and then dumping one or more on the ground. Some brand new shooters were lucky enough to participate in this excellent match with great Range Officers and stages designed by the Polo 3 Gun Club's resident Mad Scientist Bill Lewis. 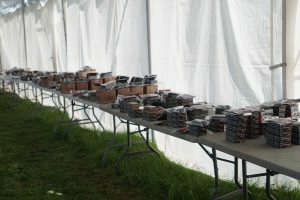 Experienced shooters who run the midwest 3 Gun circuit during spring, summer and fall from Ohio to Nebraska and south to Missouri loved the heavy round count stages and the camaraderie of a late season shooting family reunion at an excellent facility with plenty of sunshine. Shooters were greeted at check-in with a Match T-shirt, Mission 22 patches, laser etched bottle opener and a box of Federal Syntech state of the art polymer coated ammunition. Federal really stepped it up by also donating hundreds of boxes of ammo to the already considerable prize table and sending their Ammo Team Rep Ken to shoot the match and waive the Federal Ammo flag. Salute. There were many donor/sponsors from the shooting industry and everyone took home excellent prizes at the end of two sweaty days of shooting. One donor story stands out though. 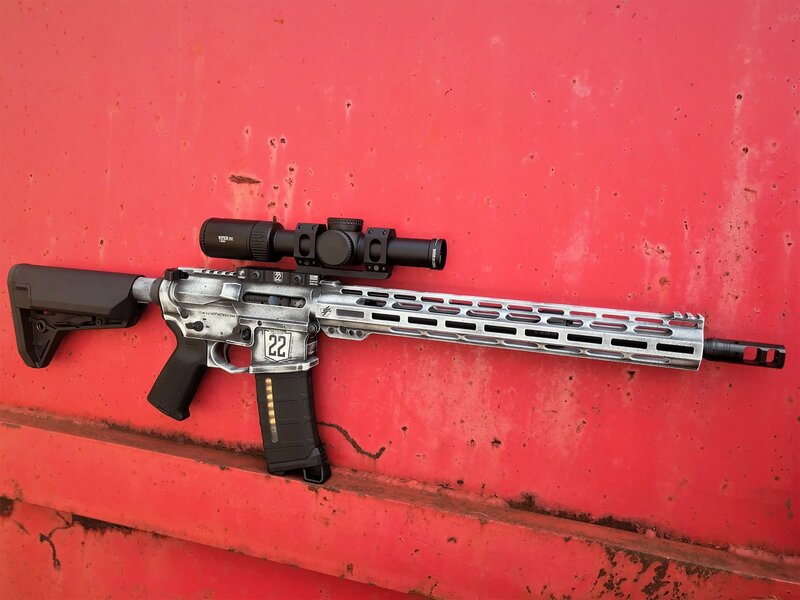 American Defense Mfg donated a gorgeous custom built AR with Vortex Optics VIper PST Gen II tactical scope to raffle to raise additional money for the charity. Mark Roth, of Roth Performance, www.xrailbyrci.com (who shoots the match at a blistering pace in flip-flops) won the gun in the raffle. He immediately waived over a teenaged girl who worked at the match, sold tickets and brought free water and Gatorade to shooters all weekend, and presented the rifle to her. You don't see that kind of generosity anywhere outside the shooting community. What a gentleman and shooting ambassador Mr Roth! Mission 22 offers considerable resources free of charge for Veterans to include Counseling, Therapy, Health Clinic access and Service Dogs. More information about public awareness, access to services and donations is available on their website at www.mission22.com. If you would like to come shoot the match next year, get on track with Mission 22 Multigun Championship by "liking" them on their Facebook page to monitor the progress for the 2019 event which will be highly anticipated by everyone who attended this year. You should also start laying in a considerable supply of ammunition over the winter! This entry was posted on September 17, 2018 at 10:33 am and is filed under Blog. You can follow any responses to this entry through the RSS 2.0 feed. This was an amazing event put on by a couple of amazing men. We cannot thank James Welker and Matt Metzger enough for their hard work and generosity. All of the 3 gun competitors were amazing as well. We look forward to seeing all of you again next year!